Dr. Joel Fodrie is an Assistant Professor in the Institute of Marine Sciences and Department of Marine Sciences at the University of North Carolina at Chapel Hill. He received his undergraduate training in Biology and History from the University of North Carolina at Chapel Hill and went on to receive his Ph.D. in Biological Oceanography from the Scripps Institution of Oceanography at the University of California, San Diego. 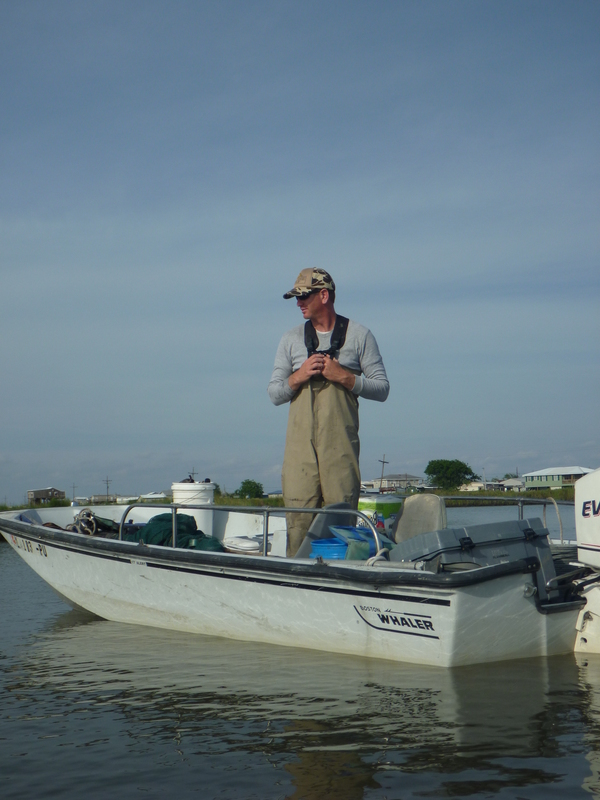 Afterward, Joel conducted postdoctoral research with the Marine Sciences Consortium at the Dauphin Island Sea Lab. Joel served on the faculty at the University of South Alabama before joining the faculty at the University of North Carolina at Chapel Hill where he is today. Joel is here with us today to tell us all about his journey through life and science. Joel has always loved going out on the water for activities like fishing, surfing, and boating. He got his first boat when he was only 13 years old! In addition, Joel is also an enthusiastic basketball player and reader of Revolutionary Era history books and biographies. These days he spends most of his free time with his two little boys (9 and 4 years old). Joel studies estuaries which are habitats where freshwater from rivers and streams mixes with the salt water of the ocean. He acts as a sort of detective to investigate how things like salt marshes, sea grasses, and oyster reefs keep this habitat healthy and to determine what may be driving observed changes in fish abundance in these areas. As an undergraduate student, Joel was a history major, but he was worried that he might not be successful writing history books. He thought that pursuing a career in science might land him a good job, but he wasn’t really sure what to do. In search of a summer job, Joel stumbled across a job posting in marine science in a hallway of the science building. He was stunned that this was the sort of thing someone could do for a living. Joel got connected with scientists in the field, started working in a lab, and found out that he really enjoyed doing research. Moving West Coast for his PhD was really tough for Joel. He felt like the oceans on the West Coast were so different from the water he was used to studying. It was frustrating to constantly feel like he was having to play catch-up, but it made him work really hard. Joel also shares a story about a project on carbon in oyster reefs that he and his collaborators were excited to submit as a manuscript and also develop further into an NSF grant proposal. After submission, Joel had a revelation where he realized that they had been thinking about the project completely wrong. This was a disappointing setback, but realizing how the system worked allowed them to start asking other interesting questions. There have been many exciting successes in Joel’s laboratory over the years. For example, he and his colleagues were thrilled to have determined the rate an oyster reef can grow vertically (an impressive 10 cm per year!). He was also excited to work with a former graduate student to quantify coastline hardening (being built up with walls and other solid structures). They discovered that 14% of our coasts in the lower 48 states of the U.S. have been hardened, and this has important habitat and environmental implications. Joel’s favorite place to travel to has been Port Saint Joe in St. Joseph Bay, Florida. It is beautiful and relatively undeveloped with a wonderful combination of temperate and tropical habitat and fauna. The breathtaking beaches even feature sand with a pinkish hue. He was able to conduct research there as a postdoctoral fellow with the Dauphin Island Sea Lab. A lot of the field work Joel and his colleagues do can be very intensive. They’ve had to be out late at night surveying fish, collecting samples in the salt water in the hot summer sun, and battling with messy, smelly equipment. In particular, they all hated working with these fish traps that cumbersome, sharp, and difficult to work with. It seemed fitting to sacrifice these traps at the end of the summer, so they stacked them up in a pyramid, shot the pile of fish traps with a flaming arrow and burned them to commemorate their struggles. Follow your gut. You know what you want best and what is best for you and what your priorities are in life. This is important for helping you make those critical decisions you will encounter. Joel studies the population dynamics of fishes and shellfish. He has conducted research along all three major U.S. coastlines, as well as in the Baltic Sea and around the Galápagos Islands. Dr. Fodrie earned his Ph.D. in Oceanography in 2006 from the Scripps Institution of Oceanography (University of California, San Diego), where he was supported as a National Science Foundation Graduate Research Fellow, and was presented with the E. W. Fager Student Award (14 recipients since 1976). He then began fisheries research in the northern Gulf of Mexico as a post-doctoral researcher at the Dauphin Island Sea Lab. Joel has maintained active research in the Gulf continuously since then. In 2009, Dr. Fodrie returned to UNC as a member of the faculty. He has contributed 42 peer-reviewed articles, book chapters, and manuscripts that explore mechanisms of population variability for fishery species. These articles appear in journals such as Proceedings of the National Academy of Sciences, BioScience, Global Change Biology, Limnology & Oceanography, Ecology, and Ecological Applications.